When E-books first came out, I was of the I'll-never-buy-one-because-I-like-the-feel-of-a-book-in-my-hand school of thought. Then I bought one. Then two. Then enough more to realize reading on a Nook was infinitely easier than holding a bound book and turning the pages, especially when reading in bed. Which is where I usually read. I also like the fact that I can make the font bigger to match my diminishing eye sight. I got a new pair of glasses last week and was amazed at how clear and bright the world looked through the new prescription. The saleswoman put a card with tee-tiny writing on it under my nose and I could read with no difficulty at all. Until I got home. Now I'm having to move my head either up or down depending on whether I'm looking far away or close up. Perhaps I should have saved the money I spent on new glasses and bought a larger Nook. 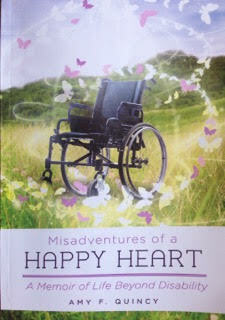 None of that made any difference when I picked up my friend Amy Quincy's newly published, signed with the author's shaky "A,"paperback Misadventures of a Happy Heart A Memoir of Life Beyond Disability. It had been a long time coming. As members of the same writers group, I've been a spectator and cheerleader as Misadventures gestated from wistful idea to finished product. Like an excited aunt, I wanted to hold the book in my hands, turn the crisp, white pages, inhale the words. Words that hadn't exactly been written in blood, but had been baptized by sweat, spilled wine and more than a few 4-letter words. Misadventures of a Happy Heart is a memoir. It's the story of how Amy picked up the pieces of her life and moved forward when, at the age of 30-something, she suffered a hemorrhagic stroke in her brain's prime real estate - the brain stem. With a degree in English with an emphasis on Creative Writing, Amy had been published before the stroke. As with most writers, however, she had to fit writing in somewhere between work and everyday life. In an odd twist of fate, the stroke provided Amy with the time to do what she always wanted to do - write. For 6 years, Amy plugged away with one finger typing at the heart-racing speed of 9 words a minute. Her life as a massage therapist may have ended when the stroke robbed her of clear vision, the ability to walk, clear speech and control of most of her body. But it did not take away her ability or desire to tell stories. Amy's post-stroke life included a lengthy hospital stay, rehabilitation training, physical therapy, adaptive therapy (horseback riding, soccer, tennis, skiing, and surfing to name a few) and the re-emergence of her once independent self. Amy eventually moved back into her own apartment with her cat, Bella and dog, Frankie. Today she can be seen driving her power chair around her neighborhood to buy groceries, get her hair cut, walk Frankie, or visit with friends at the local Starbucks. In the years that I've known Amy I've seen her maneuver in and out of handicapped vans and cars not much bigger than her wheelchair. I've helped her into hot tubs, mountain cabins, gas station bathrooms and tight shower stalls with no handicapped bars to grab onto. I've poured wine in her sippy cup on more than one occasion. With a determination she must have been born with, because how else could have come so far, Amy never gave up on her dream of writing a book. "Three paramedics arrive. They're all good-looking. I mouth the word, "cute" to Lee Anne over their bent heads and raise my eyebrows suggestively. She catches it and smiles. I scan for wedding rings. There's just something about a take-charge, good-in-a-crisis man." Amy's remarkable story begins when she notices some tingling in her lips. Upon examination, one doctor told her to have surgery, another told her "don't let anyone touch you." Before she could get a third opinion, the stoke happened and the decision was taken out of her hands. Amy writes with candor and humor about drug-induced conspiracies while in the rehab hospital. She writes honestly about "the unmentionables." Reading Misadventures of a Happy Heart is like being invited to Amy's house for Thanksgiving dinner and having a ringside seat to her sometimes difficult, sometimes dysfunctional, but always endearing family. Amy's style of writing is laugh-out-loud funny. It will bring you to tears. Try as you might you will be unable to feel sorry for Amy. With uncompromising dignity, grace and humility Amy is miracle. She knows it and so will you when you've finished reading her book. Yet Amy has no desire to become a poster child for the disabled. Instead, she's done the one thing she's always wanted to do. She told her story "with the increased urgency of someone who's been given another chance." If you're like me when you've finished Misadventures of a Happy Heart you'll go straight to Google to find everything Amy's ever written. If we're lucky, she's already working on her next book. Don't be surprised if it has something to do with a girl, a wheelchair and a trip to Mexico. For more of Amy's writings check out her website at www.amyfquincy.wordpress.com; you can also follow her on Face book https://www.facebook.com/MisadventuresofAHappyHeart/home; you can even buy an e-book version of Misadventures of A Happy Heart at Amazon here.